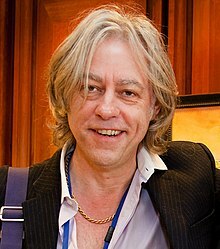 Robertus Geldof (magis notus simpliciter ut Bob Geldof natus in Dún Laoghaire Hiberniae die 5 Octobris 1951) est illustris musicus Hibernicus generis Rock. Filia eius praenomine Peaches anno 2014 mortua est. Bob Geldof etiam pro philanthropia et paupertatem allevendo conatus est. Vicimedia Communia plura habent quae ad Robertum Geldof spectant. Novissima mutatio die 11 Decembris 2018 hora 13:51 facta.